The Annicchiarico Theatre was built in 1964 as a performing space in the John F. Kennedy Apartments at One Thompson Street in Concord. The Kennedy Apartments include 82 residences and are owned and managed by the Concord Housing Authority (CHA). The theatre portion of the building was named in honor of Angela Annicchiarico, a talented musician and teacher who was an active member of the Concord Music Club until her tragic death in 1963. The Concord Music Club (CMC) had leased the Theatre from CHA since 1966 and rented the facility to outside groups at very minimal rates. When the 40 year lease between the Music Club and the Concord Housing Authority expired in 2006, attempts were made to reach an agreement for the lease to be renewed but they were unsuccessful. 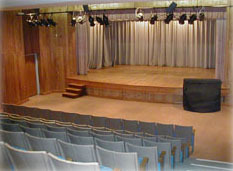 In March 2009, after several discussions with the community, the Concord Housing Authority issued a Request for Proposals for a consultant to develop a plan for the Theatre. In April 2009, the Concord Housing Authority asked The Field Organization to develop a Business Plan in an effort to determine the possible uses of the Theatre, its operating structure and possible management model.